Each cat is exercised INDIVIDUALLY 3 times a day while we clean down and feed, so they get a chance to stretch their legs and have a run about within the safe environment of our enclosed purpose built cattery.Hygiene standards are our priority and so cats do not mix, but while exercising can 'chat' to our other furry guests through the door, or between the glass anti-germ barriers between chalets. Our family run Cattery in South Dublin Stepaside, is run by Cat Lovers - For Cat Lovers, creating a caring, homely environment for your cat. 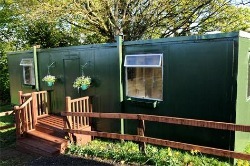 At Stepaside Cattery, we provide all the comforts of home for our furry visitors with spacious chalets overlooking our peaceful country garden - TV & Classical Music, Heated Beds in Winter, Relaxation Therapy, Grooming, Medical Administration and Post Operative care if required, and lots of TLC along the way !! Thank you to all our lovely clients (and our furry visitors!!) 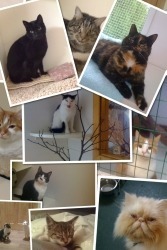 for using Stepaside Cattery and providing us with photos and references for other clients. If you would like to send us feedback about your stay with us, we are always delighted to hear from you as your comments help us to improve our service to you ! Enjoy Your Holiday While Your Cat Enjoys Theirs! We Donate to DSPCA Rescue Cats - Thank You for Helping ! Jaffa : "Suzanne has a really positive attitude towards looking after your furry family members and leaves you assured they will be cared for in the best possible way" TIna, Terenure. ONLY A FEW PLACES REMAINING FOR FEB HALF TERM & EASTER ...BOOK NOW !! Mossfield, Ballyedmonduff Rd., Stepaside, Dublin 18.